Does your garage door look kind of like this? If yes, you probably have a cracked garage door panel. Or worse, cracked panels! Do you know the signs of a cracked panel? Your garage makes loud, popping sounds when it opens and closes. If you are having trouble closing your door for any reason, the culprit might be a cracked panel. 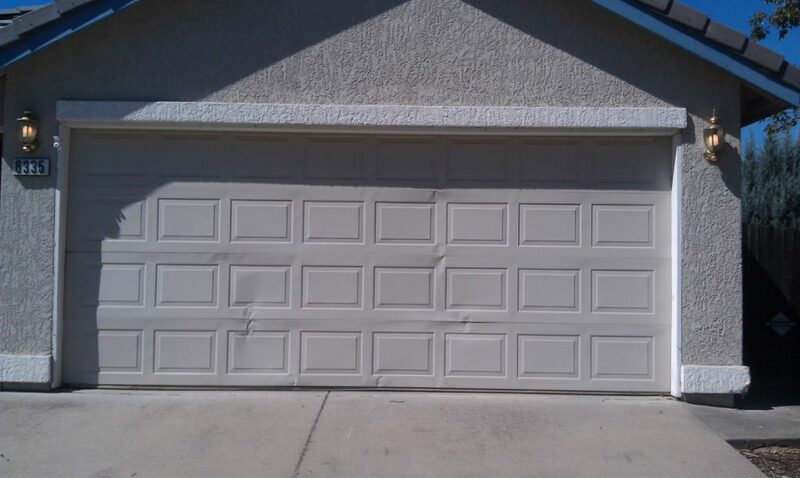 If you notice a dent or dents in your garage door, this is a pretty good visual indication your panel is cracked. A cracked garage door panel is not safe! It can collapse if the panel cracks aren’t properly fixed. The most obvious way to fix it is to just replace the panel with a new, not cracked one. This isn’t always an option. If your garage door is very old and the manufacturer doesn’t make replacement panels anymore, then you’re out of luck. If they do, then replacing the panel is a cinch. Just order the part and install! Another option for fixing a cracked panel is to replace the entire door. You can do this if you don’t have a panel replacement option. If more than 1 of your panels is cracked, regardless if panel replacements are available, you might consider just replacing the door as a more cost effective solution. Replacing the entire door can be a great thing in the long run too – you can get a newer door that includes warranties and protection against more cracks and rust. There is one option to fix the crack without replacing anything. You can install braces which work to support the damaged panel. This fix is temporary though, and will last maybe a year. The long term solution is to replace the panel or the entire garage door. A cracked panel looks unsightly and sounds pretty annoying, but it’s also very dangerous! If you aren’t sure if your panel is really cracked, call a garage door company for a quick visual inspection and make a determination. You can cal GR8 Garage Door Repair NOW – (310) 982-6428.